Owing to the screen size of your device, you may obtain a better viewing experience by rotating your device a quarter-turn (to get the so-called "landscape" screen view). We might as well start with the floor. 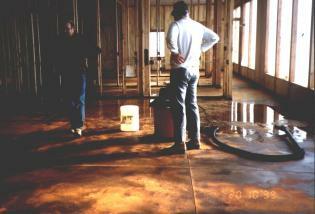 The house floor is the exposed surface of the concrete slab that is the actual foundation. It has, however, been treated with a special acid formulation that changes the actual chemistry of the top half-inch or so of the concrete and colors it in a variegated, mottled way; the picture at the right is a cheat: it is not our actual floor, but a PR photo that looks very much like our floor turned out. We use that because in most of our thoroughly amateur photos, the floor color does not show up well, owing to brightness and contrast issues. But, so you know we're not faking it, here, on the left, is a photo of our floor, taken during construction (in fact, one of the workers visible is the floor stainer). 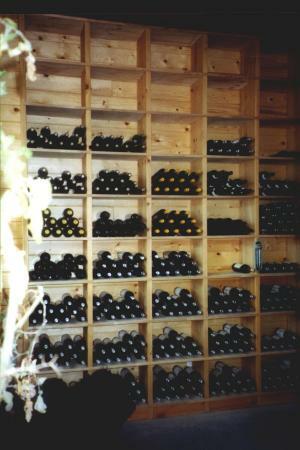 To the right is a portion (about half) of the "wine cellar" at Owlcroft House. (If you recall the floor plan, this is the west wall of the Tank Room). The frizz down the left side of the picture is one of the plants in the greenhouse area (shown below) ; the black splotch in the lower left is a too-inquisitive poodle pup. 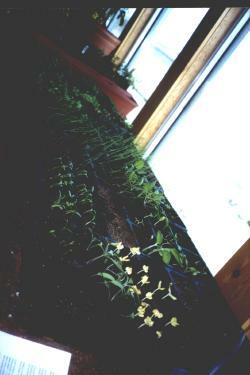 To the left is a cockamamie-angled view of a part of the greenhouse in the Tank Room--it is two feet deep and runs the full 16-foot width of the south wall. The boards sit atop plastic 55-gallon drums painted flat black and filled with water, to provide extra heat capture (from the solar input through the windows) and temperature stability. OK, now on to the house proper.